The B-1 is a "swing-wing" strategic bomber of blended wing-body design intended for high-speed low-altitude penetration missions. Eventually, it will replace the aging B-52 bomber, operational since the 1950s. The B-1 uses shorter runways than the B-52, can carry twice the payload, and has a smaller radar profile than the B-52's, making it harder for the enemy to detect. Construction of the first prototype B-1A began in late 1972 and the first flight occurred on Dec. 23, 1974. By the end of June 1977, three B-1As had made 118 flights totaling 646 hours of flying time with over 21 hours at supersonic speed and more than 35 hours at high speed below 500 ft. B-1A production was canceled by Presidential decision on June 30, 1977, but in January 1982, as a result of another Presidential decision, the Air Force directed Rockwell International to begin production of 100 B-1Bs, an improved version of the B-1A. However, on August 29th, 1984, only days before the roll-out of the first production B-1B bomber, the second B-1A prototype, 74-0159, stalled at low attitude during flight testing for the B-1B program. It was modified by having B-1B flight control system features installed. Unfortunately, the aircraft's center of gravity got unbalanced during fuel transfer management procedures, causing it to lose control. The escape capsule deployed successfully, but the parachute risers did not deploy properly. The capsule hit the ground at a steep angle, so steep that the inflatable cushions could not shield the impact. Rockwell's chief test pilot Doug Benefield was killed, and two other crew members were seriously injured. After a lengthy investigation, all the classified portions of the aircraft were recovered and the site bulldozed. Located in a remote part of the Mojave Desert, the site witnesses B-1 test flights to this day. For more information about the crash site click here. 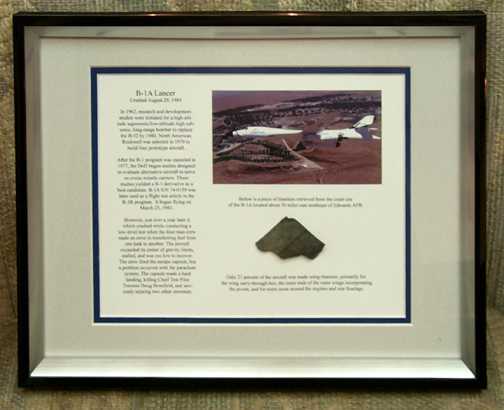 Retrieved from the crash site, this piece of titanium is a reminder of that crash and a valuable piece of history.